What if eternal youth didn’t come by way of a holy grail, or a fountain? What if it came in the form of a pair of ancient knives? The blades are said to not only take the life of a victim but also transfer the victim’s vitality to their murderer. Such knives are considered the reality behind the mythical powers of Vlad the Impaler and Jack the Ripper, showing up at just the right, or wrong time throughout the world and history, depending on which side of the blade you’re standing. 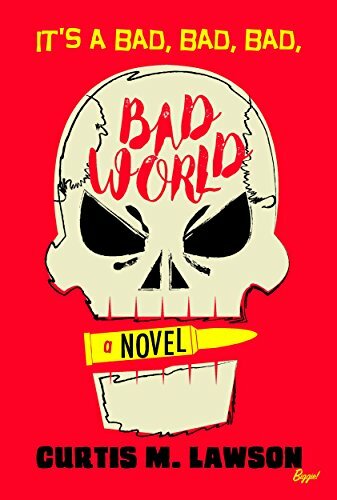 “It’s a Bad, Bad, Bad, Bad World” is one part ancient relic mystery, much like the Dan Brown novels. Characters the reader comes to trust suddenly commit acts of betrayal. Villains, (and there are a whole lot of them in this story) come from every different background, backstory and motive. In the race to possess the two knives known as the Fangs of Wallachia, an assassin nun sent by the Vatican, a ninety year old occultist, two terminal cancer patients, a junkie, a gun for hire, a cop, and a pawn dealer, a misspent teenager, an antiques dealer and an aristocrat are all entangled in a dark web. A little slow to start, Lawson’s book becomes a page turner. His characters are richly written with a plot that quickens its pace with every chapter. One part gore, one part Indiana Jones, it was a thrill ride I would highly recommend.